PRS Guitars has added two new baritone guitars to its lineup: the new SE 277 Semi-Hollow Soapbar and the SE 277. The SE 277 Semi-Hollow Soapbar is named for its baritone 27.7” scale length neck, and features a chambered traditional mahogany back, maple top, f-hole, and dual soapbar pickups. 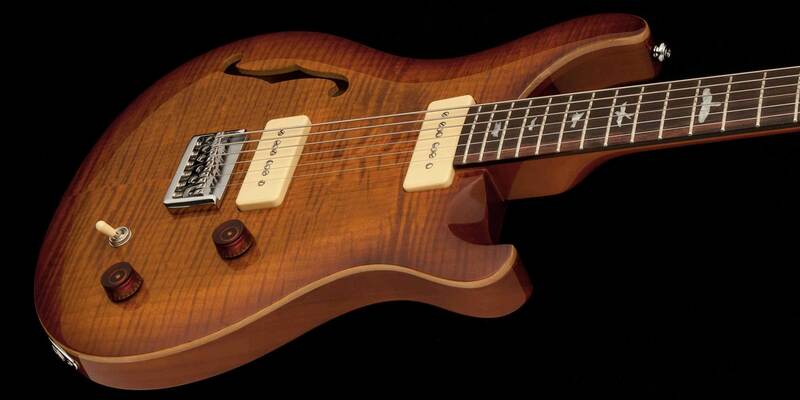 The semi-hollow body offers increased acoustic resonance and clarity, PRS said, and the soapbars pickups offer a balance of transparent, uncompressed clean tones and thick growl. Baritone guitars are tuned B to B, two-and-a-half steps below standard, and the SE 227 and SE 227 Semi-Hollow accommodate that lower range with a taut muscular low end, powerful aggressive tones and the flexibility of going from chimey clean, to warm depth, to articulate tonal hostility, PRS said. The SE 277 includes the same 27.7” baritone scale length but with a solid body and PRS SE dual humbuckers. The SE 277 covers a range of sounds, from sparkling highs, to surf-rock jangle and heavy down-tuned aggression, PRS said. The SE277 Semi Hollow Soapbar is available in gray black and vintage sunburst; the SE277 is available in black cherry and tobacco sunburst. both include a beveled maple top with flame maple veneer, mahogany back, 22-fret maple neck with rosewood fingerboard with bird inlays, PRS-designed plate-style bridge, PRS-designed tuners, volume and tone with a 3-way toggle pickup switch.